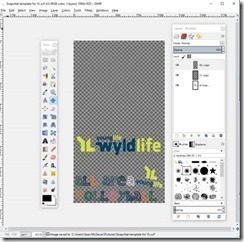 Home » Leader Links » How-To: 6 Steps to make Snapchat Geofilters for your Next YL Event! 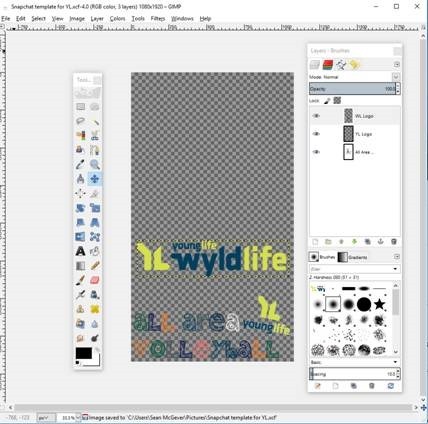 How-To: 6 Steps to make Snapchat Geofilters for your Next YL Event! 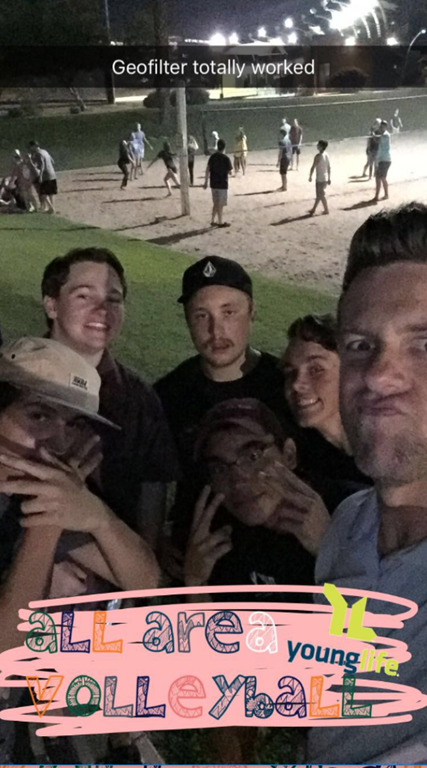 Recently I started trying out Snapchat Geofilters for YL events. If you don’t know what Snapchat is… just ask a teenager, they will tell you. If you don’t know what a Geofilter is… see my last sentence. Briefly, Geofilters are location based graphics to add over Snapchat pictures. For a short video click HERE. Why would you do this? First, it is fun! Second, kids love them. Third, it is an excellent way to get the word out about YL and WL events. You can find out all the details from Snapchat HERE. I’ve also put together a little “How-To” below. Enjoy! The graphic must be a 1080 wide x 1920 tall web-optimized .PNG. If that sounds like a foreign language to you, go to an organic cold brew coffee shop and ask anyone who is wearing sunglasses indoors and a retro hat (either a Smokey the Bear type or possibly a Fedora) to translate that for you. Alternatively download the free graphics program GIMP HERE and then use the template I’ve made HERE. For inspiration look HERE. When you are done, save it, then “export” as a “PNG”. If you need help with design you can contact me. Picking the date and time should seem simple enough. What I’ve learned is that for a club at a house, for instance, you essentially pay a set rate for almost an entire day. A house isn’t too big, and there isn’t much demand, so the price isn’t too much. 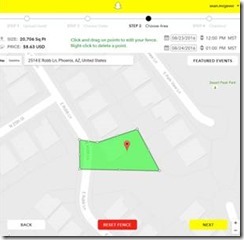 If you were to try to use a Geofilter at the Superbowl location, your price would be higher… demand increases the price. I would only pick the day of club or of the event. Don’t waste money on the Geofilter when no one will be using it. However, you will then need to submit a different Geofilter for each date (Mondays in my situation). 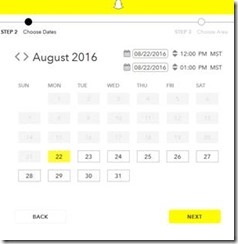 Also, you can only do this up to 30 days ahead of time, so you can’t just schedule them for the entire school year. Simply plug in the address of the location and use the Google Map enabled feature to zoom in on your location. 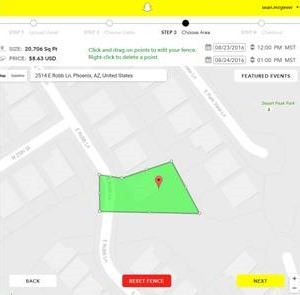 You then “draw a fence” around the location. The minimum size is 20,000 sqft, which is bigger than most houses by quite a bit. However, don’t draw the fence too big or else you will be wasting money. After this is all done, you need to enter your payment information and then submit it for review. The review can take up to 24 hours, but I’ve heard back in an hour. You will get a confirmation email when it is approved. The following day I checked back and looked at the analytics. 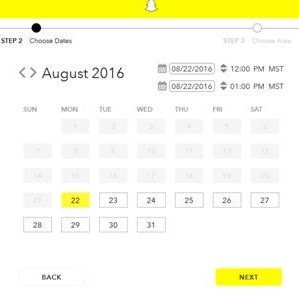 Snapchat will tell you two things: 1) How many users used it, and 2) How many impressions were made. At a recent YL event, we had 96 users and 5400 impressions. I considered that a lot because essentially 5400 very targeted people (high school friends of YL kids) checked it out. If you need help, send me a message. Have fun! Such a great tool for Promoting Club! We’ve even done a geo filter with our “fence” around our high school during the lunch hour on the mornings before Club to promote the theme (typically $5), then we let campaigners know, and let it snowball from there! Thanks for sharing with the YL community. What a great idea Jeremy! Now that you say it, I could see us doing it at a football game or something similar too. Our school has a “club” table day. We could do a promotion (2 Otter Pops instead of 1) if you do a snap with the filter. You got my wheels turning! WHAT?! I didn’t know an average joe could just make a geofilter! Sunnyslope YL is totally doing this. Thanks so much Sean! Such a great idea! Q: Did you set it up as a Personal or Business geofilter? I did a Business geofilter. I think you could do a Personal (which is free) one but it can’t include a logo. Let me know if you or anyone is able to do a personal one, I can’t seem to find much information on them.